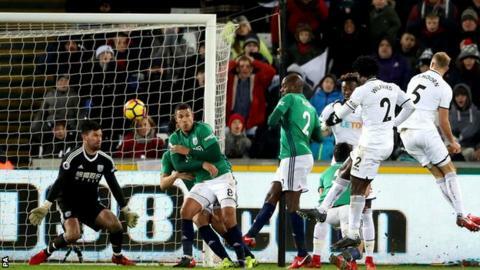 Swansea City hauled themselves off the bottom of the Premier League table as captain Wilfried Bony's emphatic late finish gave them a precious win over West Brom to ease the pressure on head coach Paul Clement. The out-of-form sides seemed paralysed by tension in a first half almost entirely devoid of any meaningful action until the visitors' Jake Livermore headed against his own post. Swansea tried admirably to raise the tempo after the interval, with Ivory Coast striker Bony inspiring his side with a determined run and shot that was narrowly wide. The hosts' search for a winner seemed set to end in vain but with nine minutes left a loose ball from a corner fell invitingly for Bony, who blasted it through a crowd of bodies to earn the Swans a first victory since October. They would however have remained bottom had Crystal Palace striker Christian Benteke not had his last-minute penalty saved in the Eagles' 2-2 draw with Bournemouth. Swansea are now a point behind West Brom and safety, providing a huge lift to Clement, whose position had been under intense scrutiny of late. This was West Brom's 14th Premier League game without victory and consigned manager Alan Pardew to a first defeat in his second game in charge. December has been an unhappy month for Swansea managers in recent years, with Bob Bradley sacked this time last year and Garry Monk shown the door 12 months earlier. Former Bayern Munich assistant manager Clement was on thin ice himself, having collected just one point from his previous seven Premier League games. In the days leading up to the game he defiantly insisted he was the man to transform Swansea's fortunes, having done so last season with a remarkable escape from relegation. But this campaign has largely been a tale of misery, with the most damning statistic perhaps the fact the Swans had lost more matches (10) than they had scored goals (eight) in 15 Premier League fixtures. Their 27 shots on target from 15 league matches was at least 10 fewer than any other team in Europe's top five divisions and a turgid start to this encounter suggested at further limited action. Their best effort in the first half came when Alfie Mawson headed narrowly over from close range. There was more urgency to Swansea's display in the second half, with Bony's low drive wide and Jordan Ayew's effort saved by Ben Foster giving the agitated home supporters reason to believe their side might be able to force a first win since October. Their perseverance paid dividends as Bony clinically pounced on a loose ball in the West Brom penalty area to revive Swansea hopes of surviving another season in the top flight. On his last visit to the Liberty Stadium a little over a year ago, Pardew's Crystal Palace team were beaten 5-4 by a Swansea side managed by American Bradley in a wildly entertaining encounter. That brilliant chaos could not have been in more stark contrast to this match, which was an undercooked suet pudding of a spectacle. If his predecessor Tony Pulis was watching, he would have been forgiven for feeling aggrieved about his sacking, considering his pragmatic brand of football was believed to be one of the contributing factors to his departure. Pardew promised to "free up" the West Brom side when he was appointed but there was little evidence of a more expansive outlook in Wales. The Baggies offered next to no attacking threat at the Liberty Stadium, their best chance falling to Salomon Rondon, who headed over the bar shortly after the visitors had fallen behind. That was the visitors' best opportunity to equalise and indeed West Brom could have conceded a second had Tammy Abraham not chipped his injury-time chance wide. That scoreline might have flattered the hosts but they deserved their victory having shown far more attacking intent in an encounter few neutrals will remember. Swansea manager Paul Clement: "It was a really important result today. As everyone knows we have been struggling for form and performances and results have not been good enough. The players have given everything today. "There has been frustration in the club that we have not performed how we are capable of. But we did what was needed to be done. The timing of the goal put us in a great position." West Brom manager Alan Pardew: "I think we deserved something as the away side. We struggled to create clear-cut chances but we had a great few chances on the break. We didn't take them and lacked a bit of conviction. There was nothing between the two teams really. "We can't question the commitment. We just need that bit of quality. That final moment, final pass or decision, it just let us down." The Swans ended a run of seven Premier League games without a win (D1 L6). The Baggies are now winless in their last 14 Premier League matches (D7 L7), their longest run in the top flight since a 16-game streak between February 2006 and August 2008. Wilfried Bony has scored two goals in his last two Premier League games - as many as he had in his previous 28 in the competition. It's the first time the Ivory Coast striker has scored in consecutive Premier League appearances since December 2014. Swansea had three shots on target in this match - only twice have they managed more in a Premier League game this season (four vs Newcastle and Leicester). After having the first shot on target in the 22nd minute, the Baggies didn't register another one in the entire match. Both sides take on in-form sides on Wednesday as Swansea host league leaders Manchester City and West Brom travel to Liverpool. Match ends, Swansea City 1, West Bromwich Albion 0. Second Half ends, Swansea City 1, West Bromwich Albion 0. Jordan Ayew (Swansea City) wins a free kick on the right wing. Foul by Kieran Gibbs (West Bromwich Albion). Roque Mesa (Swansea City) wins a free kick in the defensive half. Attempt missed. Tammy Abraham (Swansea City) right footed shot from outside the box is close, but misses to the left. Assisted by Luciano Narsingh following a fast break. Attempt blocked. Jordan Ayew (Swansea City) right footed shot from outside the box is blocked. Assisted by Ki Sung-yueng. Wilfried Bony (Swansea City) wins a free kick in the attacking half. Ki Sung-yueng (Swansea City) wins a free kick in the defensive half. Roque Mesa (Swansea City) is shown the yellow card. Foul by Roque Mesa (Swansea City). Jake Livermore (West Bromwich Albion) wins a free kick in the attacking half. Attempt saved. Wilfried Bony (Swansea City) header from the centre of the box is saved in the bottom right corner. Jonny Evans (West Bromwich Albion) is shown the yellow card for a bad foul. Tammy Abraham (Swansea City) wins a free kick on the right wing. Foul by Jonny Evans (West Bromwich Albion). Attempt missed. Salomón Rondón (West Bromwich Albion) header from the centre of the box is just a bit too high. Assisted by James McClean with a cross. Substitution, West Bromwich Albion. Chris Brunt replaces Jay Rodriguez. Goal! Swansea City 1, West Bromwich Albion 0. Wilfried Bony (Swansea City) right footed shot from the centre of the box to the top right corner following a corner. Attempt blocked. Tammy Abraham (Swansea City) header from very close range is blocked. Assisted by Ki Sung-yueng with a cross. Corner, Swansea City. Conceded by Jake Livermore. Attempt blocked. Roque Mesa (Swansea City) right footed shot from outside the box is blocked. Corner, Swansea City. Conceded by Jonny Evans. Substitution, West Bromwich Albion. Oliver Burke replaces Hal Robson-Kanu. Hal Robson-Kanu (West Bromwich Albion) is shown the yellow card. Attempt missed. Tammy Abraham (Swansea City) right footed shot from the centre of the box is close, but misses to the right. Assisted by Ki Sung-yueng with a cross following a corner. Corner, Swansea City. Conceded by Allan Nyom. Substitution, Swansea City. Tammy Abraham replaces Tom Carroll. Corner, Swansea City. Conceded by Ben Foster. Attempt saved. Jordan Ayew (Swansea City) right footed shot from the left side of the box is saved in the bottom left corner. Assisted by Tom Carroll. Attempt missed. Ahmed Hegazi (West Bromwich Albion) right footed shot from outside the box misses to the left. Attempt blocked. Jordan Ayew (Swansea City) right footed shot from outside the box is blocked. Assisted by Tom Carroll. Kyle Naughton (Swansea City) wins a free kick in the attacking half.